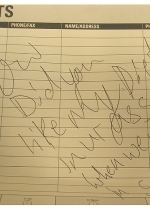 AUGUST 26--As if having her business robbed wasn't bad enough, the person or persons who broke into a small Arkansas medical employment agency also left a lewd message on the owner's desk--written in her own lipstick. According to a Fort Smith Police Department report, Rebecca Davis, owner of Concept Professionals, arrived at work Friday morning to find her office had been vandalized and $8000 in computer software, a cell phone, some DVDs, and blank payroll checks had been stolen. And written on her desktop a crude statement that should help cops narrow their search to at least one male perp.